Envato, a company that operates a set of marketplaces for digital goods, tutorial sites, and a handful of other “projects,” announced that it has launched a new service that will let you buy and sell Web templates for your WordPress blog and just about any other CMS in existence. Dubbed ThemeForest, the service runs off the engine that powers the company’s Flash and royalty-free music loops marketplaces. Items on ThemeForest sell for $10 to $50, depending on the quality of the theme and the developer’s greediness and the library currently has 150 themes in place. The site said that its membership tally is already 75,000, but that’s because the same username is used across all of the company’s marketplaces. 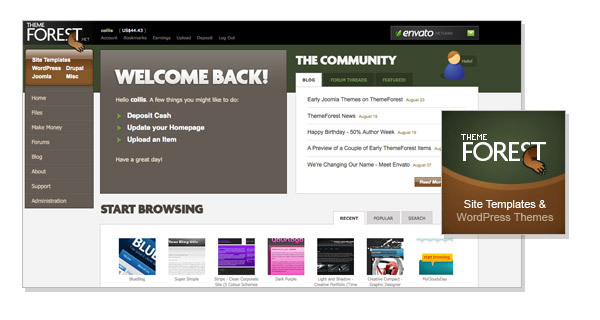 In an attempt to make it easier to buy the templates, users can deposit cash on any of Envato’s three sites and that money can be used on any of the others. So far, ThemeForest offers a healthy amount of nice themes, but can it really compete with WordPress itself? There are a slew of themes already in the wild and it’s debatable whether people want another marketplace to buy anymore.